MADISON, Wis. — In July, Rebecca Blank celebrated her fifth anniversary at the helm of the University of Wisconsin-Madison with a decadent dessert and a hefty pension future. State taxpayer funding for the UW System tops $1 billion, about one-sixth of the system’s total annual budget. UW-Madison received about $445 million in state revenue last year. With an annual salary of a half million dollars, plus benefits, that taxpayer-funded pension will one day help provide a most comfortable retirement for Blank. It’s always interesting to hear highly-paid higher education officials talk about how destitute their universities are. Blank has spent much of her tenure complaining about the state of taxpayer funding for UW-Madison, about the herculean task of enduring state budget cuts. She spoke of the “challenges” again in her anniversary blog. The actual number was $86 million, and the university’s “no easy task” involved hiking campus revenue by about $36 million and cutting vacant positions to make up the funding gap. Blank and University of Wisconsin System officials are pleading poverty again, even as they praise big spender Gov. Tony Evers for proposing a $150 million bump in state funding, and money to fund the state’s tuition freeze at Wisconsin’s public universities. Even the sizable increase is but a “starting point” for Blank. For all the System’s gnashing of teeth about funding cuts and “falling behind,” Wisconsin’s higher education system still fares pretty well in spending comparisons. State taxpayer funding for the UW System tops $1 billion, about one-sixth of the system’s total annual budget. UW-Madison received about $445 million in state revenue last year, making up north of 17 percent of its overall budget. The state has consistently ranked in the top 15 in per capita higher education spending. Wisconsin ranked 13th in 2016, the latest year available, in the StatsAmerica rankings of Higher Ed. State & Local Expenditures. StatsAmerica is a service of the Indiana Business Research Center at the Indiana University School of Business, ranking among the nation’s top business schools. The database is supported by the Economic Development Administration. By Midwest comparison, Iowa ranked 8th in per capita spending, Michigan finished 12th, Indiana 24th, and Minnesota 29th. State funding for higher education did decline, in large part because Wisconsin’s Act 10 reforms of 2011 asked public employees to contribute to their taxpayer-funded insurance and pension benefits. Most states have experienced expenditure declines since the Great Recession. Only nine states are back to pre-recession funding levels, according to a new report from the State Higher Education Executive Officers Association that tracks higher ed spending over the last decade since the Great Recession. The latest Grapevine report, an annual compilation of data on state tax support for higher education, shows Wisconsin fiscal support for higher education up 4.2 percent in fiscal year 2018-19, and up 6.7 percent over the two years of fiscal 2019 to 2017. Spending was 41 percent over the five-year period between fiscal year 2014 and 2019, ranking 4th in percentage change. That compares to 18.3 percent nationally. The Grapevine numbers don’t account for inflation. When doing so, Wisconsin doesn’t fare as well, according Sophia Laderman, senior policy analyst for the State Higher Education Executive Officers Association (SHEEO), which tracks funding levels based on full-time equivalency data. The organization’s newly released “State Higher Education Finance” report lists Wisconsin among just nine states that are back to pre-recession funding levels. Laderman, however, said the number is somewhat misleading. Looking to lift some burden from property taxpayers, the state in 2015 replaced $406 million in local funds to Wisconsin’s Technical College System with offsetting state funds. Without such offsets, Wisconsin is one of 30 states funding postsecondary education at a lower level than pre-recession highs. “Wisconsin is still doing better than a lot of states. A lot of states that have the ability to fund higher education aren’t,” Laderman said. The association is a member organization, of course, serving the postsecondary education industry. UW System is a member of SHEEO, which has a clear interest in higher education funding. UW campuses have experienced declining enrollments for several years. Most recently, the UW System’s 26 campuses saw enrollment declines by nearly 2,600 students combined, or 1.5 percent, the result of a shrinking pool of Wisconsin high school seniors. There is a strong fiscal argument to suggest that taxpayer commitment should diminish with the declining enrollment figures. 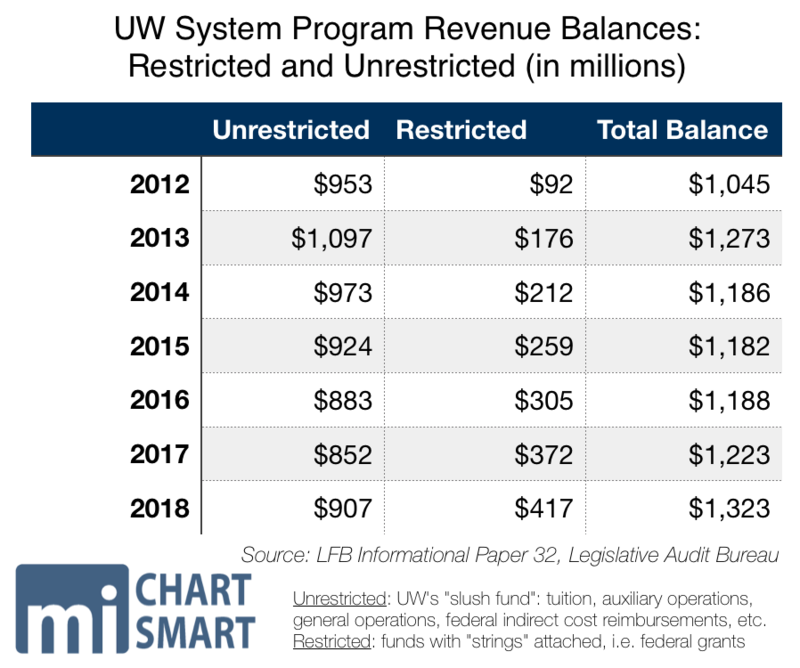 In 2013, the System drew fire from the Legislature after lawmakers found significant cash balances, what some called the UW System’s “slush fund.” Unrestricted fund balances at the time checked in at nearly $1.1 billion. Furious that the System continued to seek state funding increases while hiking tuition each year, the Legislature and then-Gov. Scott Walker froze in-state tuition and demanded Wisconsin’s universities and colleges use up a portion of their balances to help fill their budgets. Last year, the System’s unrestricted fund balance was $907 million. The UW System, despite declining enrollments, remains one of the largest systems of higher education in the nation, boasting more than 170,000 students — ranking it in the top 50 in the world. For all of the sky-is-falling rhetoric from Blank and UW System officials, the University of Wisconsin-Madison ranked 43rd worldwide for the second year in a row by the Times Higher Education World University Rankings last year. It remains 23rd out of 172 institutions in the United States. A pretty good showing for a university that Blank would have you believe is living hand to mouth.